Between the beach, pool, and heat our skin takes a beating in the summer. In order to maintain healthy skin I use a hydrating body wash everyday. The Dial brand sent me a sample of Dial Coconut Water Refreshing Mango body wash in exchange for this review. All opinions are mine. Until recently I haven't had the highest opinion of Dial soap. When you read Dial soap do you picture the old orange bar from your childhood? The bar that dried out your skin and didn't smell like a girl? If you did, you have the same perception of Dial that I did. I tried Dial's body wash a year ago for the first time. After trying the Coconut Water body wash I like it much better than the Vitamin Boost formula. While I need a body wash that is moisturizing, the second thing I look for is a great scent. I absolutely love the smell of the mango body wash. The smells reminds me of the tropics. I like that the scent is subtle after washing it off. While I like having a body wash that smells good in the shower, I don't want to walk around smelling like a mango all day. Coconut water is a leading trend right now since it's rich in antioxidants and electrolytes that provide replenishing hydration for your skin. Mango is known for being a rich nutrient. Combining the two was a great idea. For more information, check out Dial's website and Facebook page. 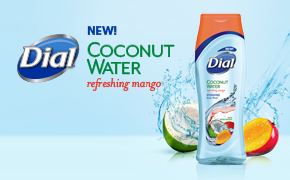 I'm sure you want to try the Dial Coconut Water Refreshing Mango body wash for yourself. Three lucky winner will receive a coupon to try out the product. Enter on the Rafflecopter form. Fun! Sounds like it'd smell great! Thanks for the opportunity to try it!